Used Alfa Romeo Spider Review - 1996-2004 Servicing, MPG, Insurance | What Car? What used Alfa Romeo Spider sports will I get for my budget? 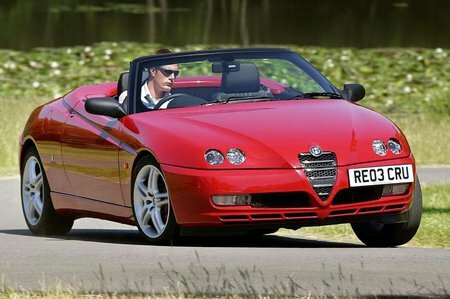 How much does it cost to run a Alfa Romeo Spider sports? Older Alfa Romeo Spiders are cheap to buy, but will need major work to keep them going. They will also probably be rusty. Buying the newest and the best you can find will pay in the long term, but even on these check the history and the car match up. The hood must be in good shape, too, because it costs a fortune to replace. No Spiders will be cheap to insure, although the 2.0-litre models fall into a lower insurance group than the 3.0-litres. Annual servicing is expensive, and it's also wise to change the engine's cambelt every three years or 36,000 miles. Spares are reasonably priced, and using one of the many non-franchised specialist garages will save on main-dealer prices. Official fuel economy figures promise up to 30mpg for the 2.0-litre and 24mpg for the 3.0-litre, but don't expect to hit these figures in everyday driving.